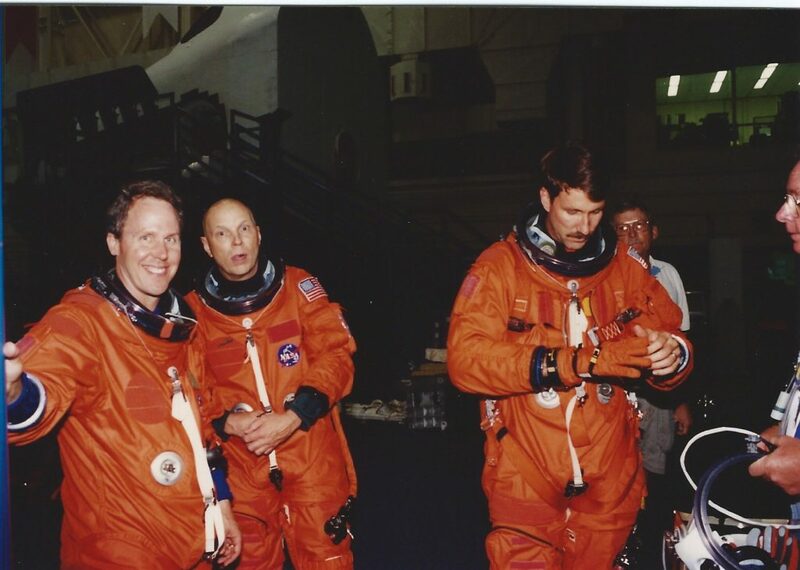 Brought together in late 1995, the NASA and United Space Alliance training team for STS-80 is shown below, along with our space shuttle crew. We are posing in front of the Full Fuselage Trainer, a full-scale mockup of the shuttle orbiter’s fuselage and payload bay (it didn’t have wings). Made mostly of wood, the FFT is now at the Seattle Museum of Flight, showcased in an impressive space gallery enclosed in a giant wall of glass. 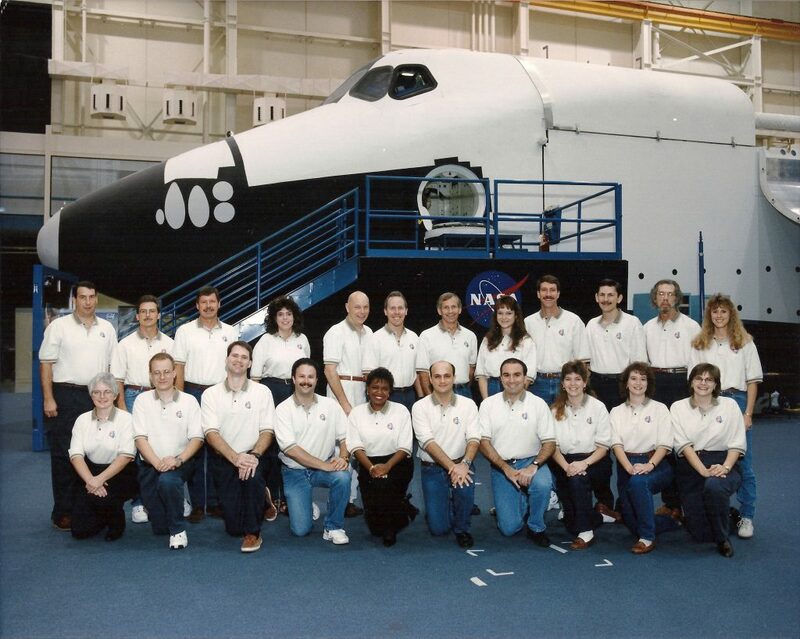 The STS-80 training team and flight crew: Front row from left: Jean Gill, Mike Jensen, Wes Penney, Michael Grabois, Jackie Prewitt, Henry Lampazzi, John Limongelli, Tori Palmer, Heidi Jennings, Kelsey Watts. Back row from left: Chris Noyes, James Tinch, Bill Preston, Kim Kennedy, [the crew of Story, Tom, Taco, Tammy, and Rommel] Alan Burge, Dave Shaw(? ), Jenny Young. James Tinch: on-the-job-trainee for PDRS with Chris. Practicing for orbit operations in the fixed base simulator, I sit in the pilot seat while handling some flight plan chores. I’m entering a command into the General Purpose Computer keyboard on the pilot’s side of the flight deck. 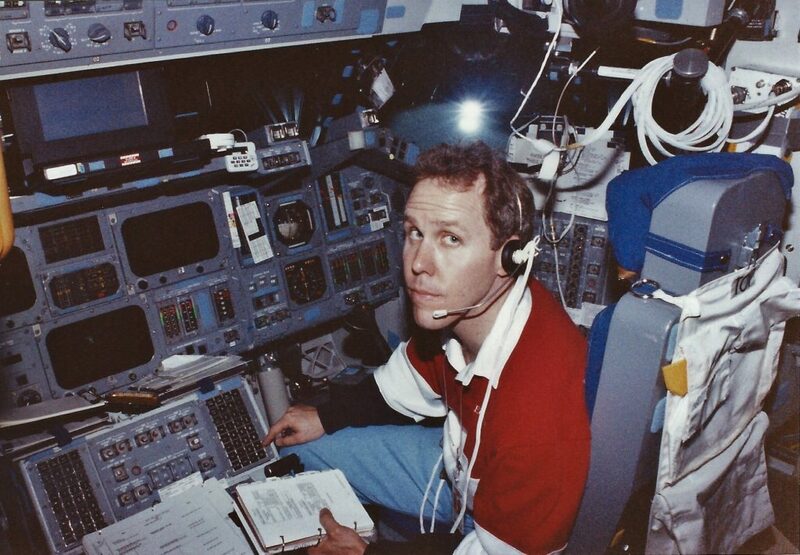 We wore headsets so we could hear mission control clearly; the simulator speaker was sometimes distorted. 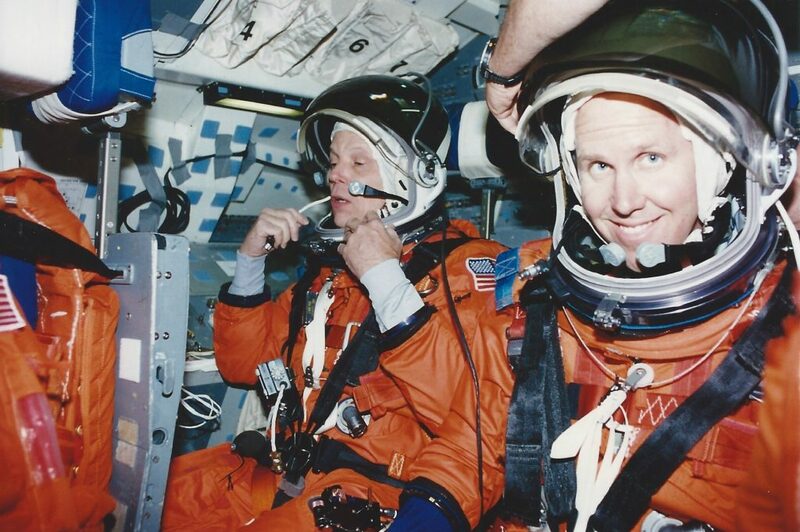 The white caddy at right holds checklists (called flight data file) handy during free fall. The laptop at upper left showed us our position over the globe. Egress training: We used the Cockpit Configuration Trainer in Building 9 at Johnson for practicing emergency egress from the shuttle cabin. The CCT could rotate 90 degrees to put us in a launch position, for exercising an emergency launch pad escape from the cabin. Here you see Story and I on the flight deck in the MS-1 and MS-2 seats, respectively, readying for an emergency egress run. Similarly, we rehearsed getting out of the shuttle cabin during reentry, either for bailout in flight or for leaving the flight deck after a crash landing. Tammy rode the MS-1 seat during entry. I stayed put in the flight engineer’s seat, MS-2. All our ACES (Advanced Crew Escape Suit) suit gear, checklists, and intercom systems were realistically outfitted for these exercises. 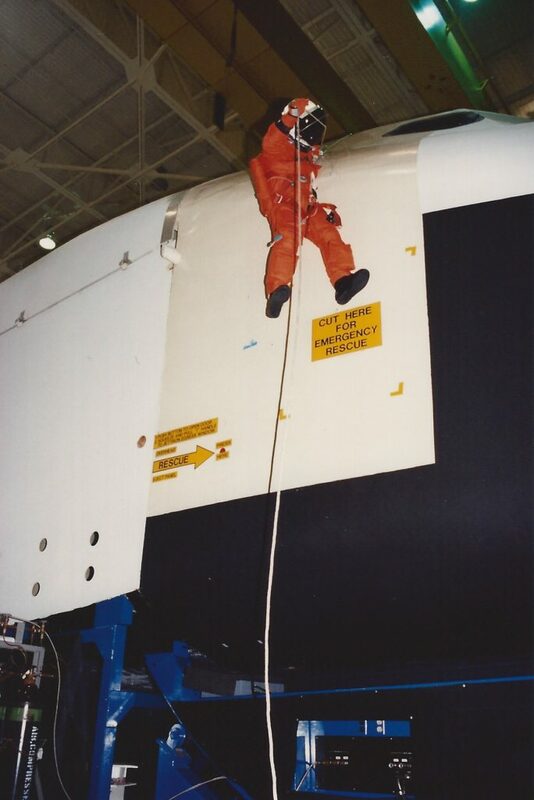 Our egress training also included using the Sky Genie escape rope to exit the top (jettisonable) window on the port side of the orbiter aft flight deck. We watched our crewmates descend via the Sky Genie while we waited our turn. Tammy Jernigan and Tom wait to climb to the flight deck and exit the top, aft, port window (Window 8). I am holding a cooling air hose that blows into a fitting on the torso. Tom, Story, and Rommel await their turn on the Sky Genie next to the Full Fuselage Trainer. Sitting atop the FFT after exiting from the top left window on the roof of the flight deck, the view is a bit scary: you’re up about three stories off the ground, with only one rope and the parachute harness to ensure safety. Here I am letting down from the orbiter’s starboard side, feeding the rope through the Sky Genie brake. “Hanging on for dear life” is the phrase that ran through my mind. 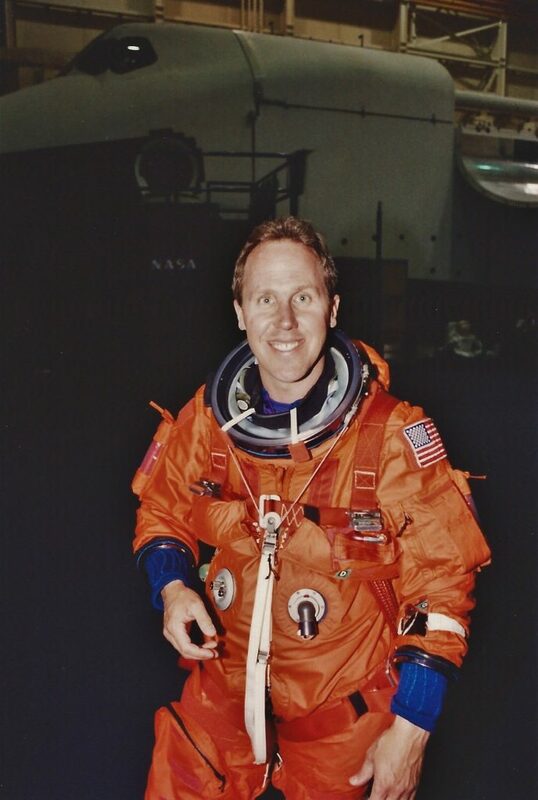 In the photo below, I’m in front of the FFT with my Advanced Crew Escape Suit (ACES), a full pressure suit evolved from the earlier NASA Launch and Entry Suit. 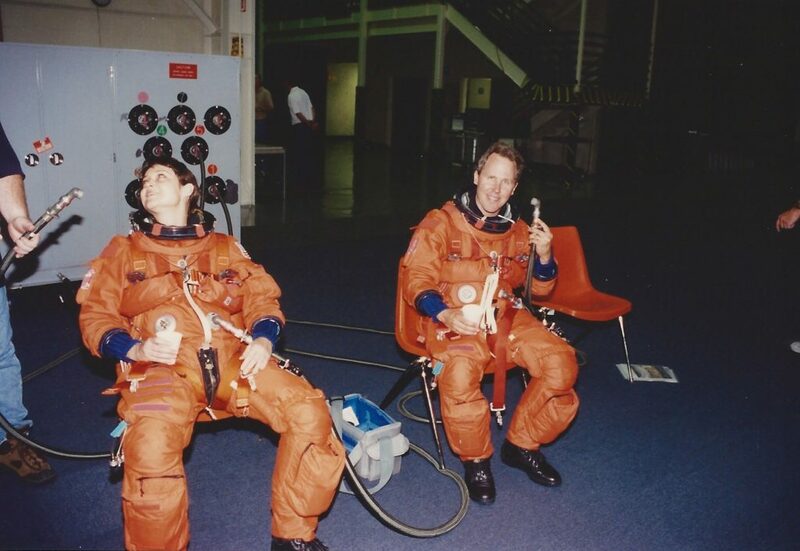 I think David Clark made these suits for NASA, based on experience with the SR-71 pressure suits. Our astronomical satellite, ORFEUS-SPAS, would be deployed on Flight Day 1 by Tammy Jernigan and me. 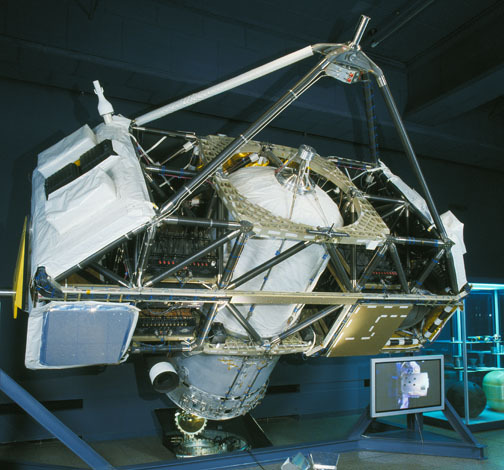 We trained for remote manipulator system operations with ORFEUS SPAS in the fixed base simulator, and in Building 9 at Johnson with the Manipulator Development Facility (MDF). 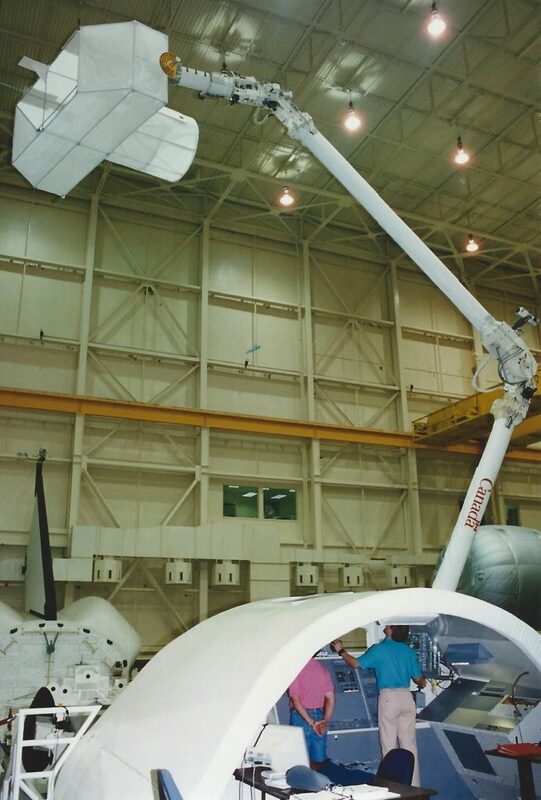 Here a hydraulically powered arm mimicked the behavior of the shuttle’s electric-motor-driven robot arm, using lightweight, full-scale replicas of our satellite cargoes, sometimes inflated with helium to counteract their weight on Earth. In each facility, we ran through all our release and grapple operations until we could handle the arm precisely in a variety of normal and emergency operations. Tom handling the RMS controls at the MDF with SPAS on the end of the arm. The satellite is merely a lightweight plastic framework with fabric panels. 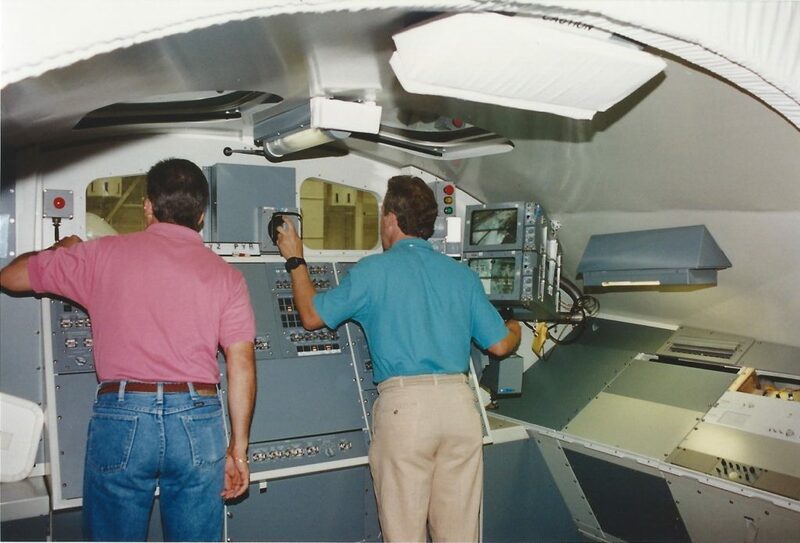 Tom (on right) handles RMS controls in the MDF aft flight deck. My instructor puts me through the wringer with SPAS, even though Tammy was the prime operator for release and grapple during the mission. The reusable Shuttle Pallet Satellite spacecraft, retrieved on our STS-80 mission and then flown again the following year with a different telescope package (CRISTA), is now on display in the Deutsches Museum in Munich. CRISTA SPAS – our reusable satellite (ORFEUS SPAS on our mission) is now on display in Munich. A project of the German space agency, it flew on four shuttle missions. 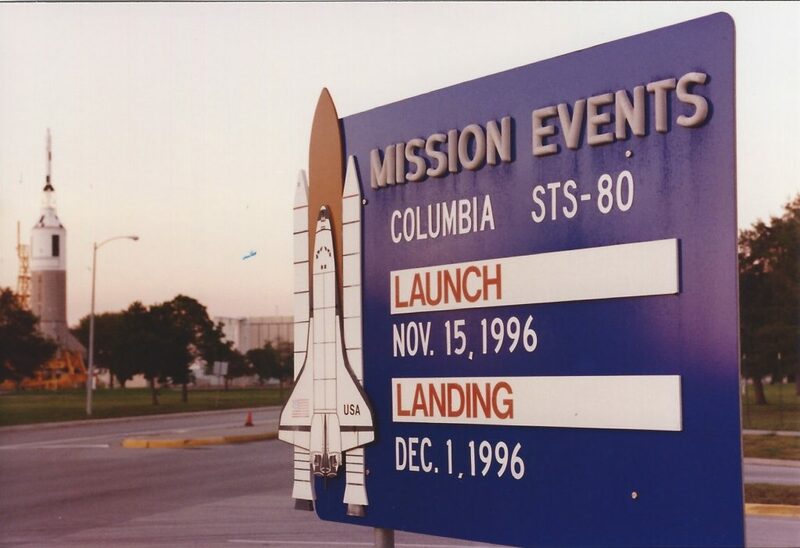 For the full story, read the STS-80 chapters in “Sky Walking”. Book links can be found at www.AstronautTomJones.com.